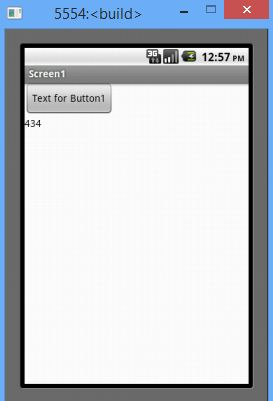 Each testcase I wrote is embedded in a simple app “template”, consisting of a button and a label (I used the default names, Button1 and Label1). The button is used to run the testcase, and the label is used to display its output. I ran each test on both the emulator and a real device (a Samsung Galaxy Tab 3), although I only show screenshots of the emulator in the examples below. The ‘places’ parameter specifies how many digits to print after the decimal point. I discovered it can print a number to any number of decimal places; this was a surprise, given that many industrial strength programming language implementations can’t do that! This allowed me to show the floating-point implementation in all its glory. There’s a simpler way to show that App Inventor uses floating-point, or at least get a clue that that’s what it’s using. If you enter a number of 16 to 17 digits or more, it will be changed as soon as you hit enter. It is converted instantly, like in a spreadsheet cell. That number, 0.1234567890123456634920984242853592149913311004638671875, is in fact the double-precision floating-point number closest to 0.12345678901234567. 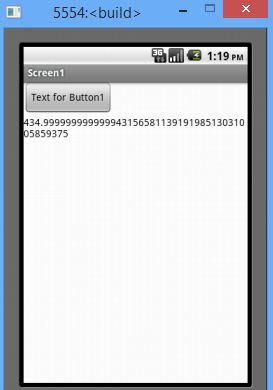 App Inventor displays it as 0.12345678901234566 because that is the full floating-point number rounded to 17 digits. So even though App Inventor changed the external representation from 0.12345678901234567 to 0.12345678901234566, it doesn’t matter; both convert to the same floating-point number internally. The three examples that follow show mathematical results that surprise the uninitiated; I’ve written about them in other contexts. 0.3 and 0.6 converted to floating-point, and then added, does not give 0.9. 0.9 converted to floating-point does not even give 0.9! 4.35 * 100 is 435, so floor(4.35 * 100) is 435, right? Not in floating-point. 4.35 * 100 is slightly less than 435, so the floor is 434. Algebraically, it should always return 1: c = a – 0.1*(10*a – 10) = a – (a-1) = 1. The answer is not 1, but -128! Should App Inventor Hide Binary? Maybe it’s best to hide binary until new programmers get more experience — and start programming real apps in Java. I’ve got a unit conversion program that was giving me weird answers for 0C to F and R. and sometimes for other problems. I jury-rigged a work-around but I know all I did was hid the problem. So THAT’S what’s going on. What can we do about it? Can I just show the results of calculation (since it’s big intigers) as decimals and just eliminate the whole thing? I would have to know more about your calculation to attempt to answer. Well, for each unit, there’s two conversion fractions (two denominators and two numerators each) and for the temperatures there’s also subtraction and addition. Some of the parts of the fractions are in decimal form. Tomorrow, I’ll give you a specific example. So here’s an example, m to ft.
As you can see, part of this is in decimal form. I can think of three solutions. 1. Use text blocks rather than number blocks. Math functions could simply reject them. 2. Convert to decimal at specific points, but that would still leave decimals in text blocks to be automatically converted to bicimals. 3. turn 1/2.54 to 100/254, but there would be a LOT of code to get through to fully implement. So, of course, this is the most likely to work. I think you have to go with something along the lines of solution #3.; that is, use integers. Floating-point literals in text blocks are still converted to IEEE (i.e., limited-precision) floating-point. I know that this isn’t what this site is about, but it’s too cool to not share. I made Android give me a complex number as an answer. I’d done it before, but this time was cooler than the others. 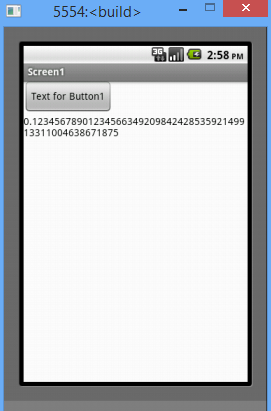 In my app’s probability conversion units I have logarithmic units of probability and in the upcoming version, I have /π as a unit (that is, per π as % is per hundred) as a unit. And I was playing around, converting various things from /π to various logarithmic units and I discovered that anything greater than π/π is not only ridiculous (as that would be greater than 1), but also crates a complex number when converted to one of the logarithmic units of probability. I ALSO discovered that when converted to nats (which is a logit based on e) it the complex number has the form x+ πi. So I set finding out what probability gets you 1+ πi. It turns out that 4.96992639477188 /π probability (or just 1.58197671 which I know is more than certainty) equals 1+ πi nats. Which I think is REALLY cool.